Time for a little history lesson. Let’s go back to 2012, my first year as a duathlete. 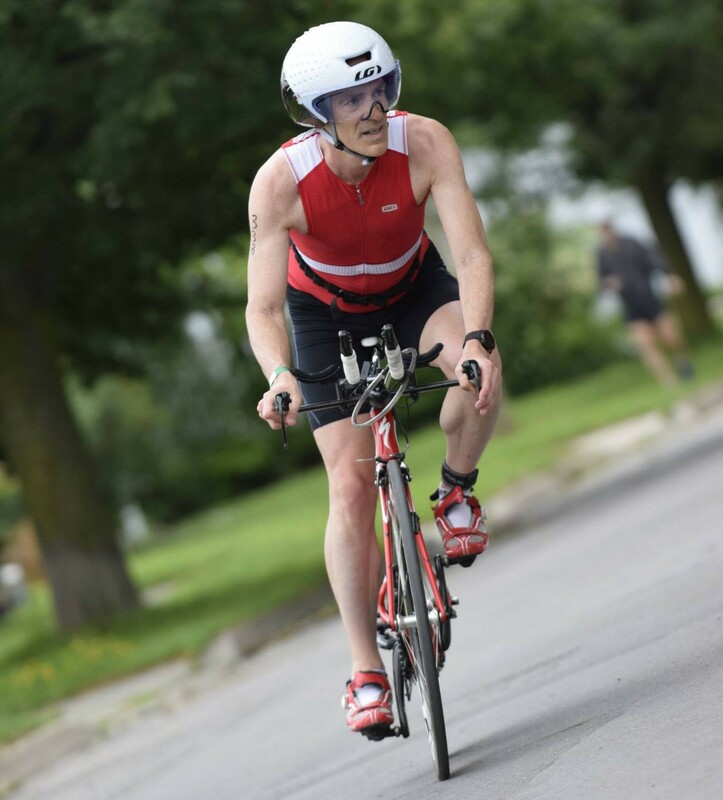 I had circled MultiSport Canada‘s Cobourg stop on my schedule, to qualify for Worlds in Ottawa at the race that had been awarded the Ontario Championships. But let’s be honest…I wanted to win. I lost seconds on each leg and was beaten into 2nd by 57 seconds by Kevin Smith (in 1:59:35). 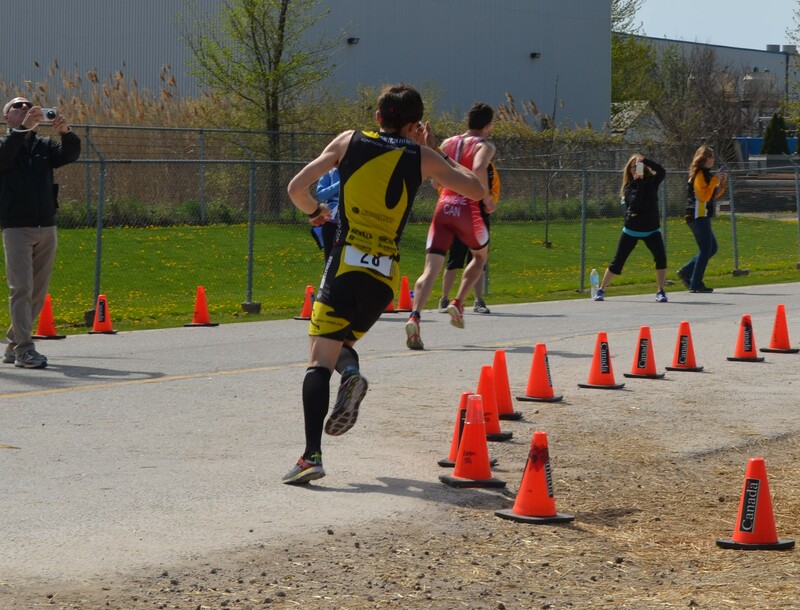 Fast forward to last May: I went to Iron Hawk (the Ontario Sprint Duathlon Championships) with vague designs on getting the provincial title I missed out on the previous two years (Belle River in 2013 didn’t fit into my schedule logistically)…yet on race day I was foiled by names such as Sanders, Bechtel, Forbes and Loewen. 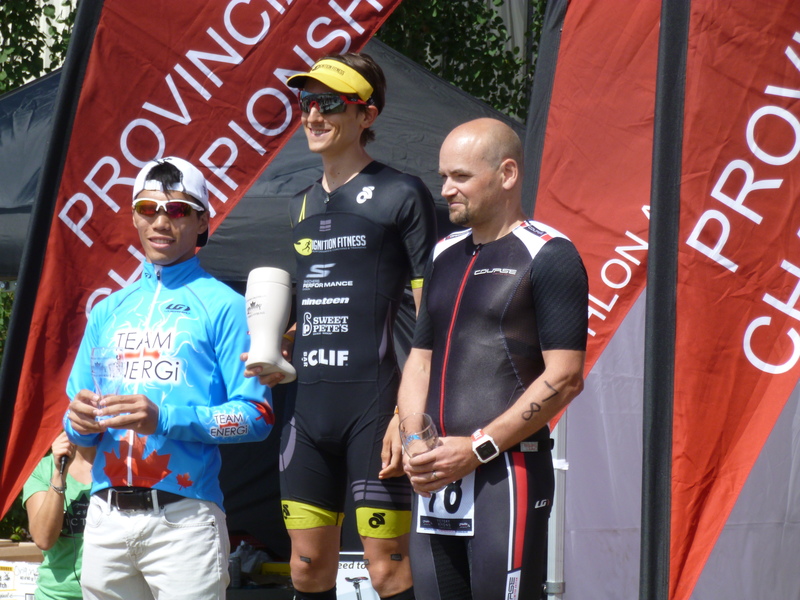 On July 18, 2015, however, I would not be denied…even if I was racing in a different province than previous years. 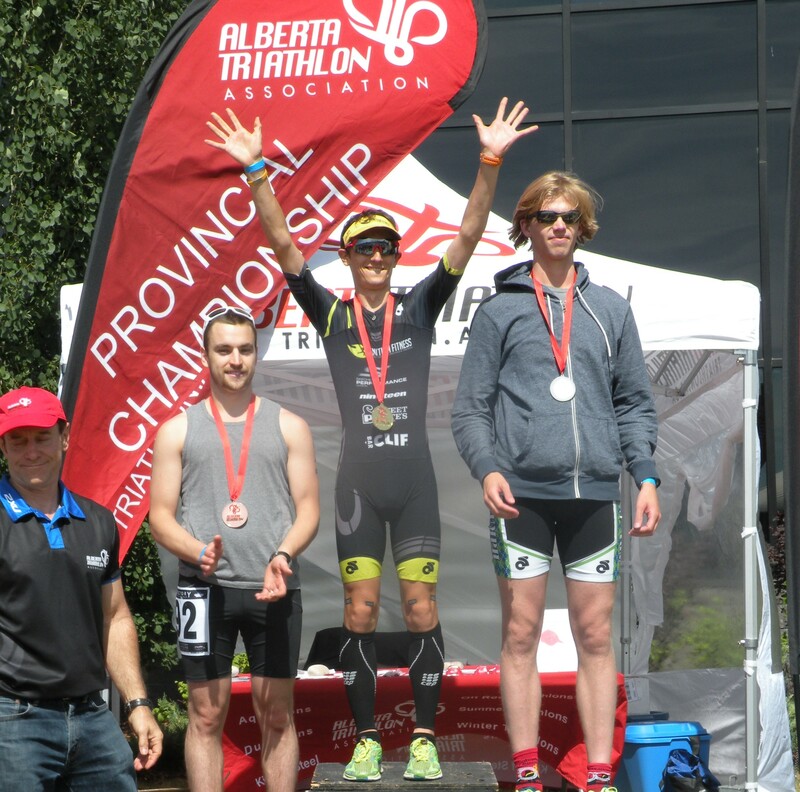 I circled the Victory Duathlon a few months ago when I found out the ATA had named it the provincial championships, hoping I could take a shot at that elusive title. Originally, the format was to be a 5k/40k/10k…inverting the runs of the standard distance and making for a good but not perfect prep race for Nationals in September. So the late change that swapped the race distances and preserved the international standard distance was welcomed by me. Not to mention the fact that the massive rainstorm that was supposed to hit on race day came a day early! The day started early enough, and happening upon a rollover accident, a convoluted construction detour and a freight train didn’t stop me from being at the race site before transition opened. Being the superstitious athlete that I am, I chose to forego my bike mechanical run-through on the road and give my bike a static check on the rack. Then off for my run warm-up on the course with a few race pace accelerations. Ritual, ritual, ritual. I went off strong, but under control. 10km is a long way to go, and I didn’t want to go about biting off more than I could chew by ripping a 3:07 first kilometer. I had some welcome help the first lap of the two lap run course, as a few of the athletes from the sprint race paced off me which helped me to keep the pace steady at ~3:33-3:34/km. Other than that, the run was pretty uneventful as I just tried to hold my pace, focusing on smooth running form, hydration and nutrition. There is still some room for improvement on my running. I have to give kudos to the organizers here; they could have given us a course full of long, single loop out-and-back sections, but instead they chose to give the athletes a true Worlds-like feel for this Worlds qualifier by creating a very spectator friendly, looped course that featured a two lap first run, four 10km laps on the bike, followed by a one lap final run. Because of this, my grandparents and my aunt were able to come out to the race, and see me compete throughout the day instead of sitting out in the wind for two hours just for a few sightings! On the flip side, this did make for a bike course that was a tad slow. Add to that the fact that the way out featured a net downhill and a hard tailwind, with an uphill drag into a headwind back to transition, and it made for an uneven ride. My average speed would spike above 40kph on the fast section before dropping back to the 38’s by the time I completed each lap! I put in a very consistent ride, coming in with lap times that were very close to the same on each lap, and came into T2 after putting my stamp on the race with another very solid bike split. 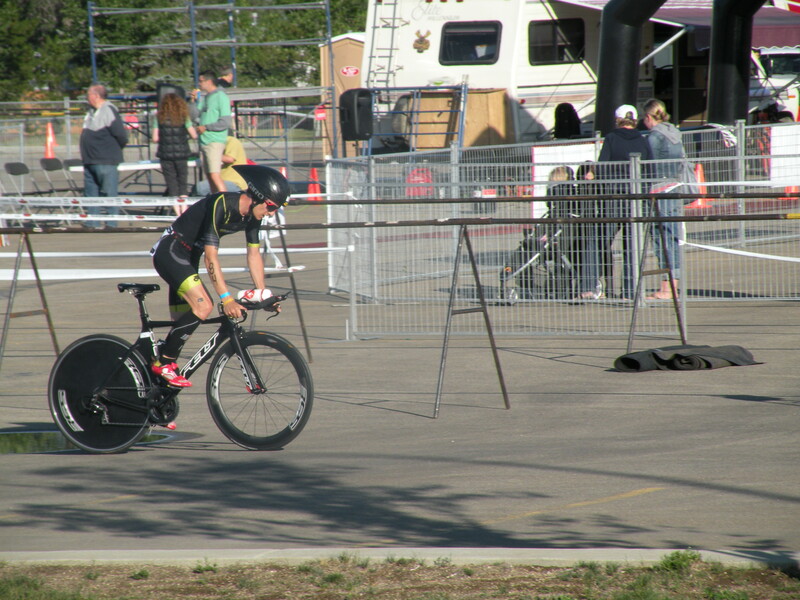 Now, over the course of the bike leg I couldn’t help but notice a figure in black I recognized from the duathlon start line who seemed to be making headway on me on each lap of the bike. This motivated me to push on the bike, and starting the 4th lap it dawned on me that there was a good chance I would stay away for the win (barring a major blow-up on the run). Not knowing my competition very well, however, gave me some impetus to work hard on the second run to secure my first major championship. Simply stated…I was a bit of a mess on the second run. To be fair 5 seconds/km slower than the first run is a pretty solid day at the office for me, as I am usually 10+ seconds/km off my first run pace after a strong ride. So to run that close to my first run pace after such a strong ride is encouraging. The second run was a mixture of emotions and pushing through the effort left in my legs from the bike. 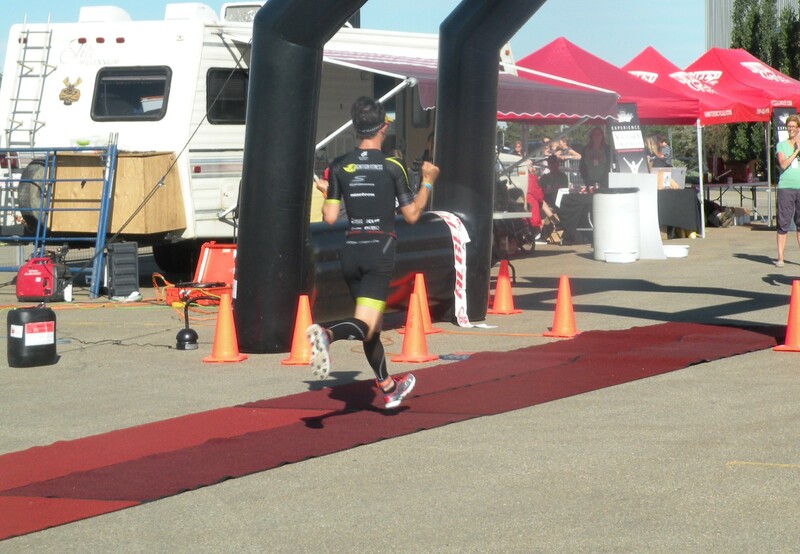 Coming to the finish felt like a dream, and as I crossed the line I pumped both fists and broke down a little bit. A huge smile was plastered on my face. This one was a long time coming, but I did have to earn it. 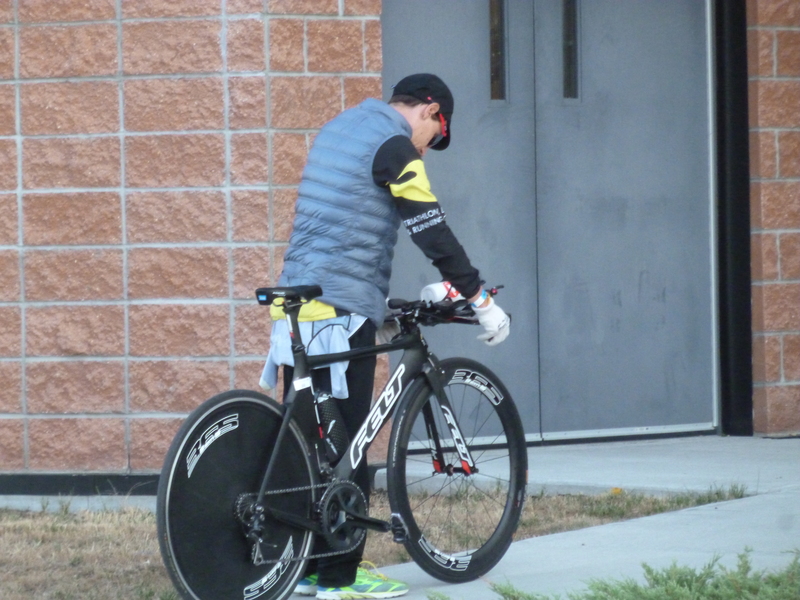 The figure in black I kept seeing on the bike was Moritz Haager, a former triathlete (and blog reader!) 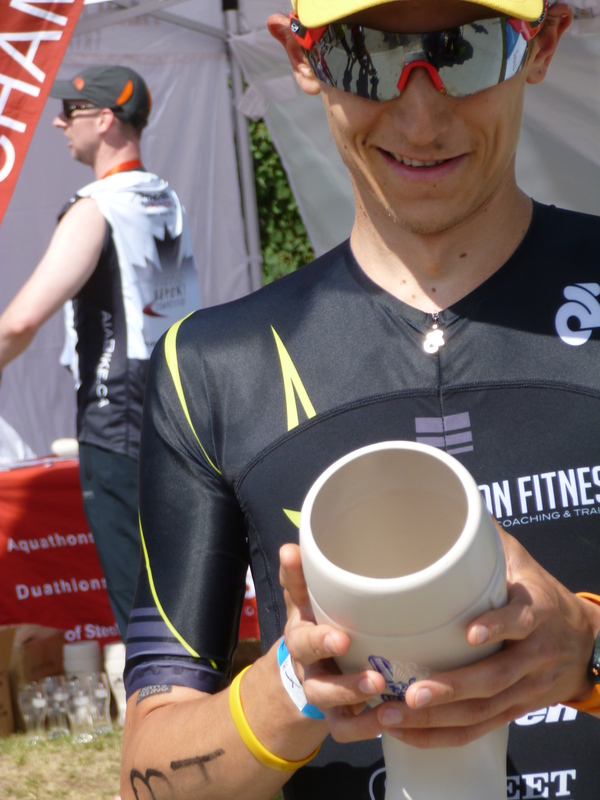 who turned to duathlons this year and recorded a VERY solid 1:59:13 finish. This is a name to file away in your memory banks folks, as he put in a very steady all around race. 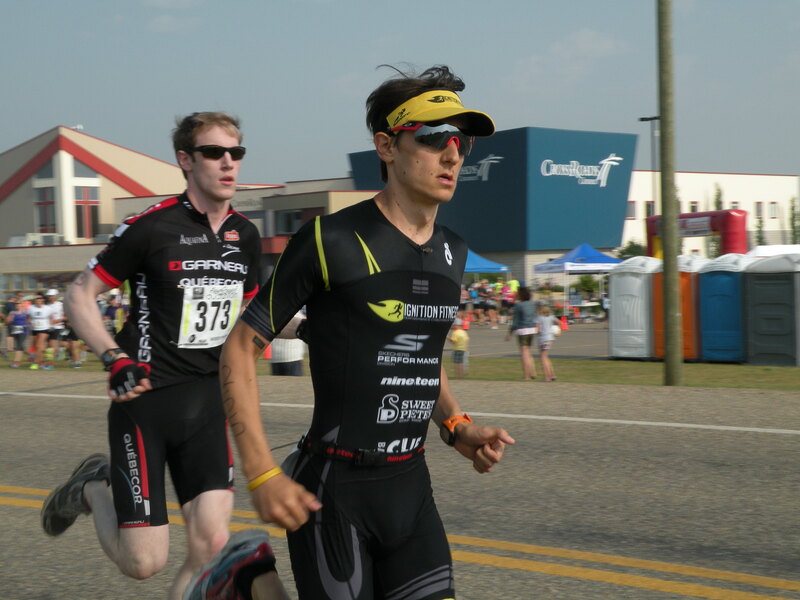 Also of note in 3rd place was Liyang Wang finishing in 2:03. Liyang is from Ajax but is out here in Alberta doing an internship…a name to watch for my Ontario readers. Very solid performances you two! This was a very big day for me. In a race that was meant to be an international distance tune-up for Esprit, I was able to put together a very solid start to finish performance…can’t ask for more than that! 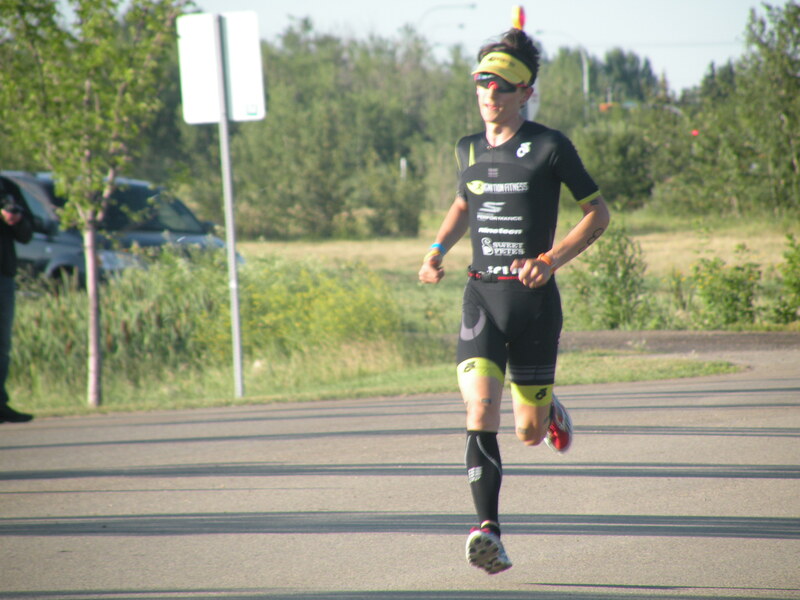 Thank you to the race organizers and Alberta Triathlon who put on a very solid event with a Worlds like feel, an awesome development for a Worlds qualifier such as this. 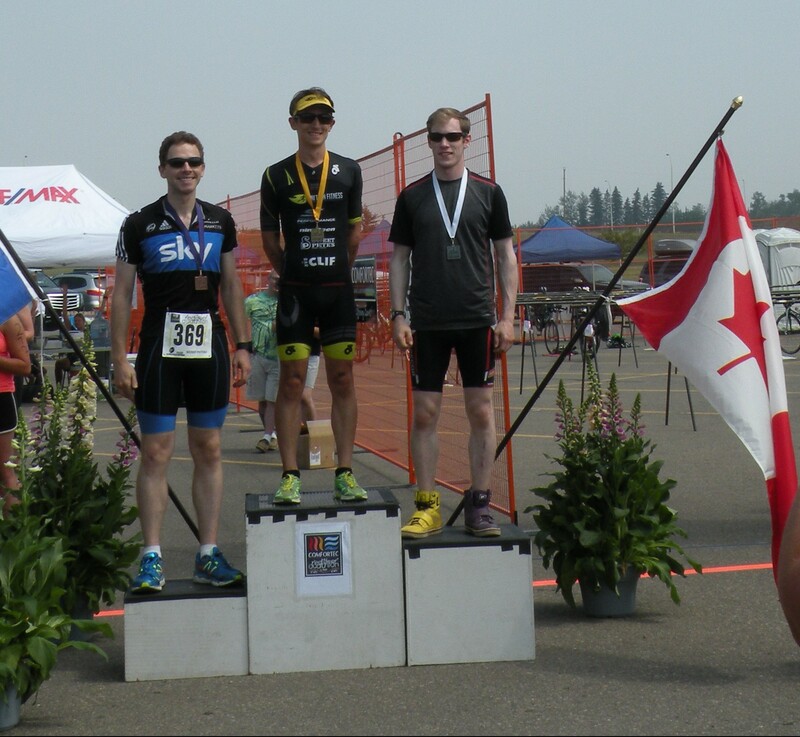 And as always, my equipment and support crew put me in the best possible position to succeed: my 3SIXTY5 Cycling FAT 60 once again helped me deliver the top bike split on the day (across all disciplines)…if you are looking for a good set of race wheels, check them out (and use discount code “jesse-2015” to receive $50 off)! My Skechers Performance GOMeb Speed 3’s have quickly become my favourite racing shoe. And of course, I am proud to represent Ignition Fitness at venues across Canada. Tommy really has helped me reach another level. I’ll be heading back to the Bat Cave for the next 6 weeks to prepare for my next challenges…looking forward to the journey. So until next time…keep Du’ing it! I was not originally going to do this preview, planning to opt for Belwood instead. 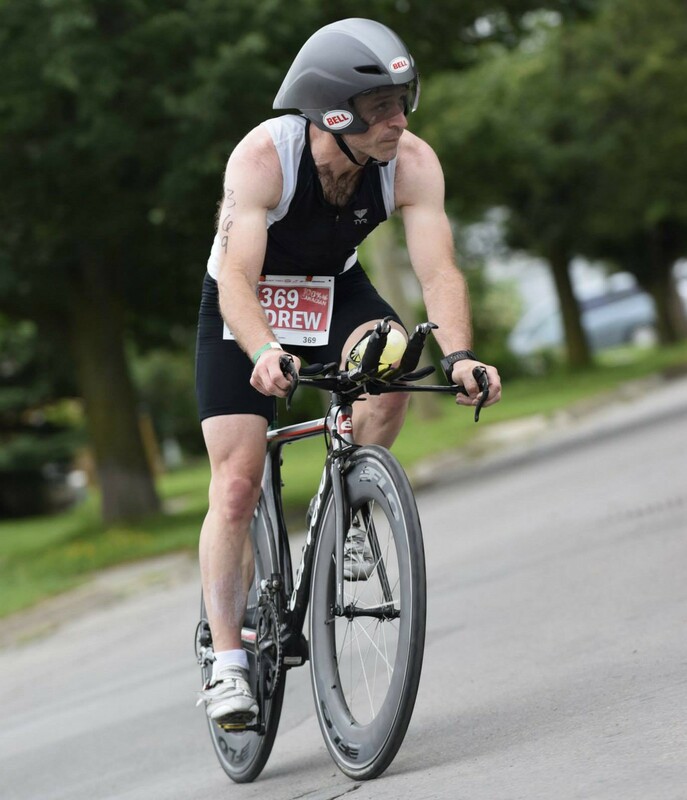 But after my Belwood preview fell through and I got wind of a fresh field shaping up for the Gravenhurst International Duathlon, I decided to make it up to y’all by doing a preview. What makes it more intriguing is the fact that Gravenhurst is going to be the first really big duathlon of the season in Canada, and will be followed in close succession by Magog and Charlevoix on July 25/26 (not to mention the Victory Duathlon in Leduc this weekend, where I will be racing). The sprint distance is relatively well developed this year, with 10 sub-1:00 performances already this year, and with a late date for Nationals July is a perfect time for those who fancy themselves contenders to show their faces at the longer distance. 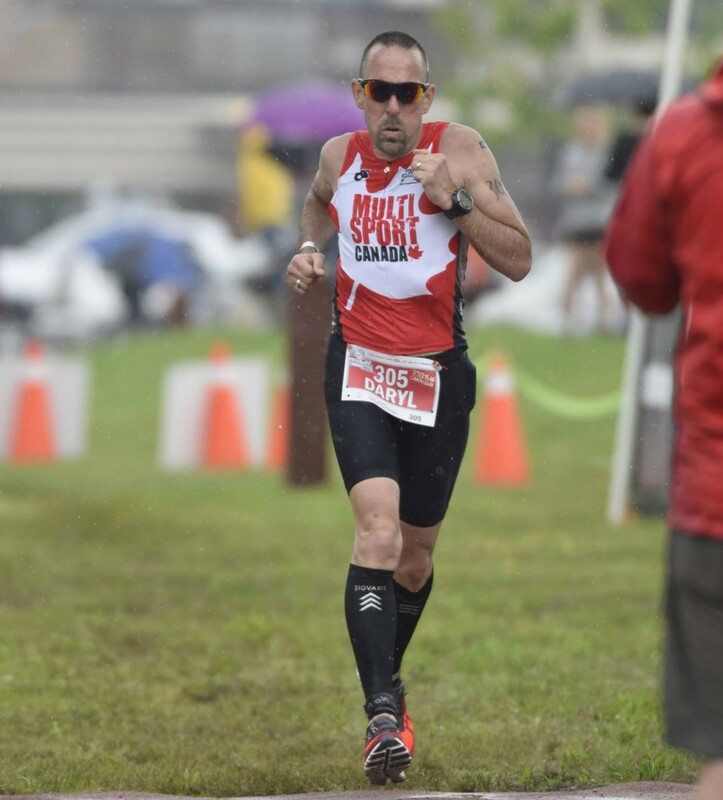 Currently, our own Daryl Flacks has the best recorded time in a sanctioned 10k/40k/5k race, with his 2:04:25 at Belle River, though that will surely change over the next two weekends. First, a little bit about the course. Gravenhurst is a tough course, especially for the international distance. The run is a tough out and back full of nasty little pitches and no relief from the sun and heat. The forecast is calling for ~20 degrees and not much wind, but on an exposed course (even moreso with the new bike course, or so I am told) the sun can have a dramatic effect. The new bike course is a wild card, but it looks to be similarly rolling to the old course, it not a little flatter overall. Times will likely be faster this year, due to the bike course and the stiffer competition. It is most definitely a course that favours strong athletes, and the day will tell us who has been eating their Wheaties! These two get a bit of a bump over the rest of the field, due either to performance or uncertainty. Flacks actually currently holds the fastest sanctioned international distance time in Canada right now, at 2:04:25, and he can groove pretty well over the longer distance. McLeod is a veteran of this course who knows the roads well, and even with the new bike route he will have the benefit of experience. The last time these two raced the gap was less than 90 seconds, and both are strong athletes built for a long haul…perfect for a course like this. These two will make it interesting for each of the top 5 positions, two athletes defined by steadiness. Walker continues his successful comeback from a year off racing due to heart issues this year, with his lethal bike (on perhaps the cleanest set-up in Ontario) slowly coming back. Look for Walker to use his strength to push Flacks and McLeod hard. 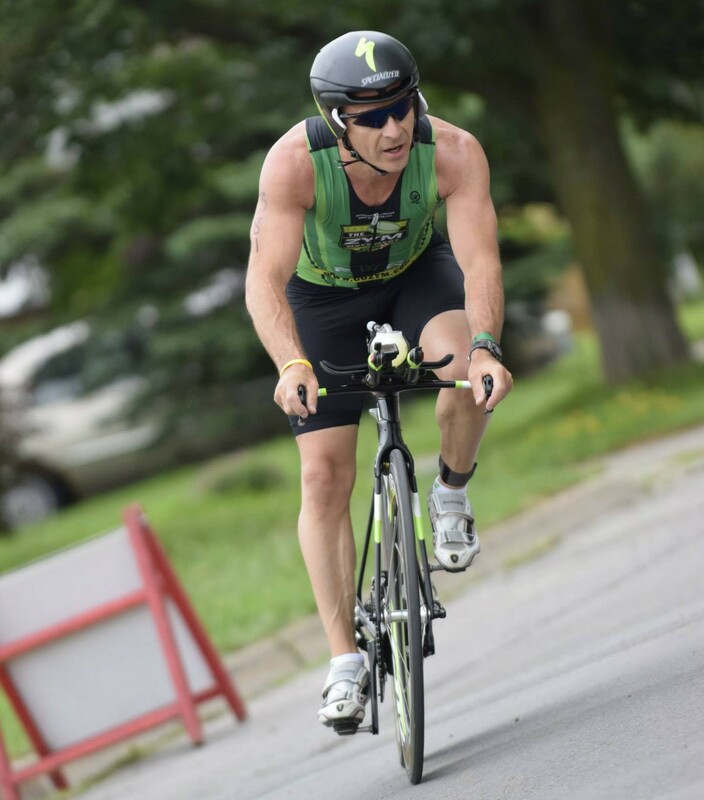 Gallagher is trying to race himself into duathlon shape after a spring of marathon racing, though his legs weathered by several years of Cabot Trail Relay racing will be well suited to this undulating run course. I think Darren will be the one to shake up the standings this weekend, as he really has become a model of consistency. Since Lakeside last year (and maybe before), Darren has proven to be the one to pick up the pieces. 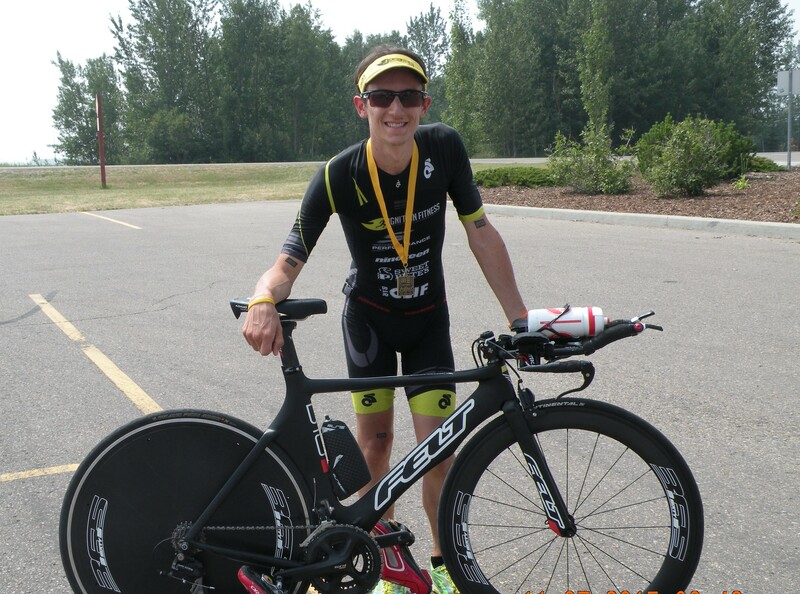 A late bloomer in the sport, Darren is coming off the high of his first overall win in Guelph last month. Steady as can be, Darren will likely upset the finishing order of the top 5 come the finish on Saturday. Darren, I am expecting a smile just like this in the finish line photos this weekend! A dark horse could come out of the weeds for sure, but I don’t see all that many more making the trip to Gravenhurst with one to Bracebridge on tap next month. Many of these athletes sure to be present on Saturday have either raced light race schedules this year or are named Flacks/Walker (ie. bulletproof to racing every weekend). The heat and exposure could play a big factor in how the front of this race plays out, but I think recent history puts Flacks in the driver’s seat for this one. McLeod will be less than a minute back and ready to pounce if Daryl doesn’t figure out the hydration issues that plagued him in Belle River and suffers in the heat. As for times, I can’t see them being earth-shattering…the course is too much of a bear. I would lean towards a war of attrition here. 2:07-2:08 should win, with 2:08-2:09 good for second and 2:10’s to round out the top 5. Those times are likely worth 3-4 minutes faster on a more favourable course. Guys, pay attention to the little things like core temperature and getting enough electrolytes in. 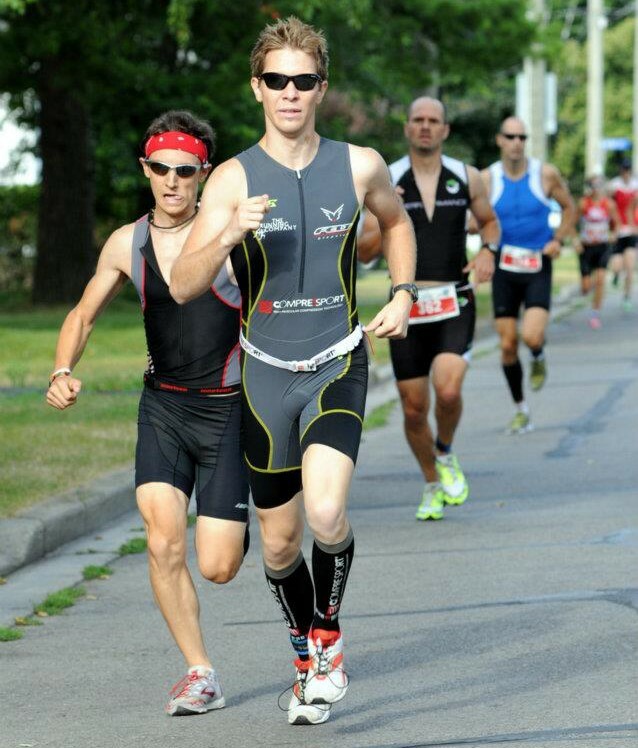 Gravenhurst isn’t a course to be tough on! Let’s see how these go! I’ll be watching with interest. Until next time, keep Du’ing it! This spring was essentially a season of coming up just a bit short of my goals. 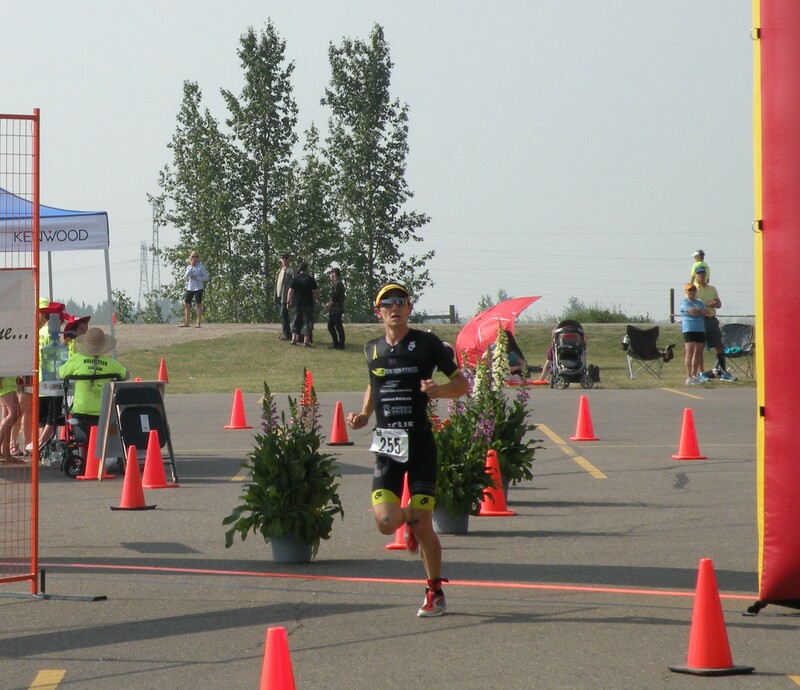 My focuses for the spring, St. Albert and Calgary, both ended up being less than a minute off my goals for those races. This is understandable given that a really rough winter left me with not much choice but to try to race myself into shape by May. Still, I was able to record some PBs for 10 miles and the half marathon, as well as sharing some unforgettable experiences and races with family that I have been away from for a long time. This year was a growth year, and I really enjoyed my spring experiences despite the results not being exactly what I wanted. And isn’t that the real goal here? I decided that the Footstock Duathlon would make an excellent rust buster for me. I’ve noticed results of this race the last couple years on Sportstats, and it always intrigued me. One of my favourite childhood memories is driving to Cochrane (the venue for Footstock) for the best ice cream around as a treat, so chalk up another experience for me in my growth year. As an added bonus the race has a 40k bike leg that I could use as preparation for Nationals. Sailing into transition after the first run at Footstock. Before the “fun” started! Unfortunately, the race wouldn’t turn out as I envisioned. 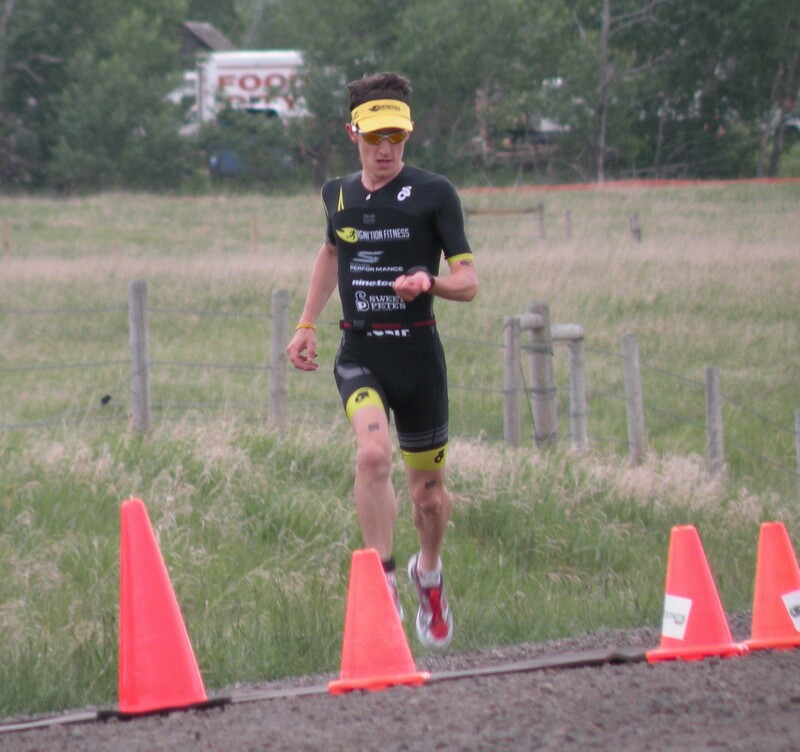 The course climbs out of Cochrane from the start/finish to the transition zone, then continues to the turnaround on the bike. After a solid run and a good steady bike where I extended my lead to ~5 minutes, I learned a valuable lesson about racing in the mountains: be prepared for anything. 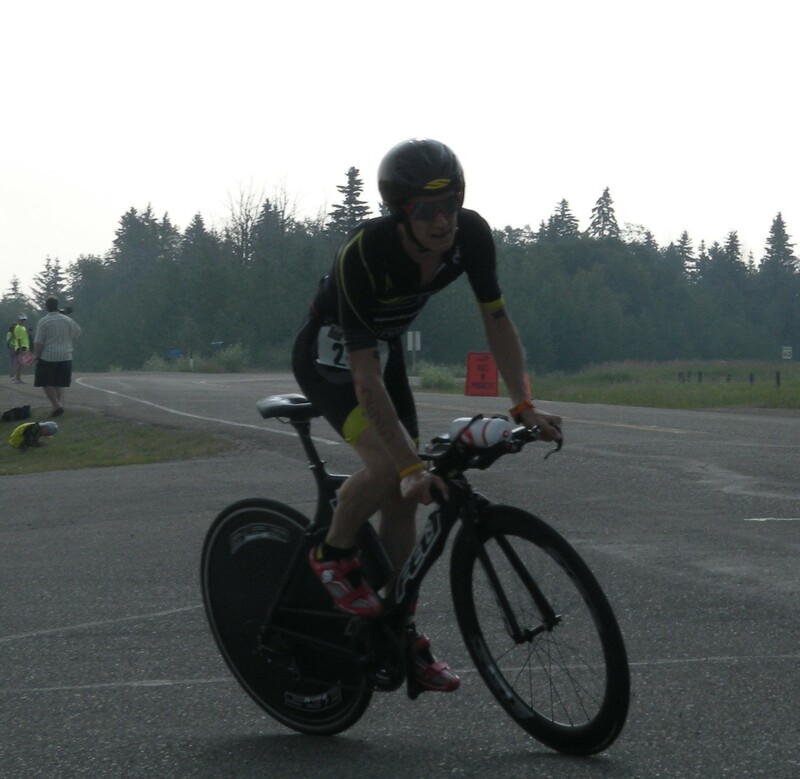 Despite 6 degree temperatures and overcast skies threatening rain, I chose to race in just my Champion Systems skinsuit and no warm weather gear. I got caught in a freak rainstorm on the bike, and I had to call it a day at halfway. The official reason was hypothermia, and I spent the rest of the day in urgent care. After Footstock, I had a chance to re-assess my goals and finalize my race schedule for the summer. The sparse Alberta duathlon schedule limited my options, but I went back into my pain cave for a few weeks, had a breakthrough workout or two, and came out for the Comfortec Red Deer Duathlon with nothing more than getting some race miles in, maybe finally cracking 1:00 for a sprint duathlon, and perhaps finally putting up a respectable bike split. The true goal on this day was to do my best to execute and then identify some areas to improve, so I could address them prior to Nationals. 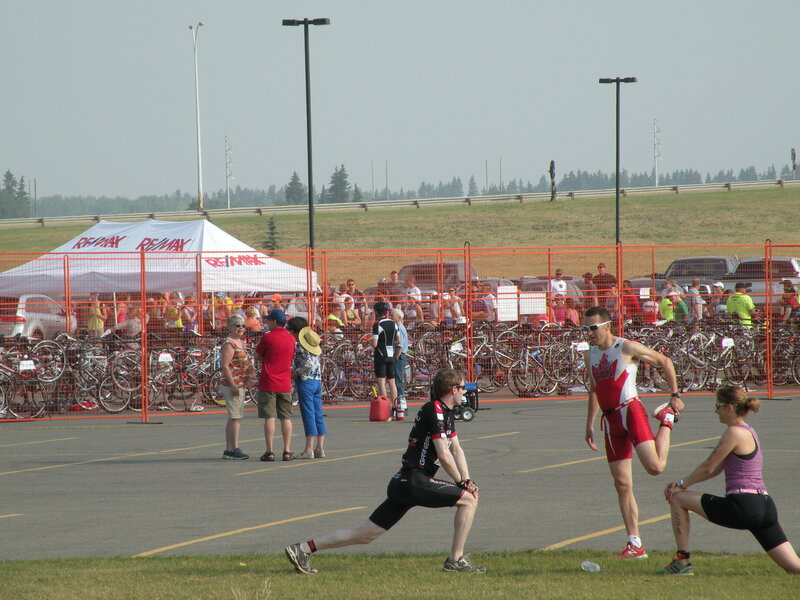 I picked out the Comfortec Red Deer Duathlon for a couple reasons: (1) I LOVE the idea of a duathlon only event in the summer…even for a start-up event it brings out the whole multisport community to experience a duathlon and increase the level of competition and (2) it uses the standard duathlon distances, a rare idea for Alberta duathlons, and utilized a relatively simple and flat out-and-back course that promised to be fast. The organizers really went all out to give the race a pro-like feel. I had already set up my transition when the thought occurred to me that I didn’t take my bike out to spin through gears (not enough caffeine obviously), so I decided to forego it and just run through the gears while the bike was racked. I hung around transition and mingled a little bit with the people who stopped to oogle my bike on their way by before heading out for a warm-up on the deceptively tough run course. It was always either going slightly up or slightly down, making it a little bit tough to get into a rhythm and really roll, and probably 30-45 seconds slow. I went off the front from the gun at a solid but controlled pace, but had some unexpected company in the form of one tough fella in my age group. He put himself on my shoulder and seemed determined to stay there; I would drop him on the uphills, but every time the road went down he dug deep and clawed his way back in. I got rid of him for good with about a mile to go, on the biggest uphill of the run, as I put in a big surge to get ahead. Heading out on the first run, with some unexpected but welcomed company. I transitioned well, better than I expected, and was out on the bike feeling pretty sprightly. 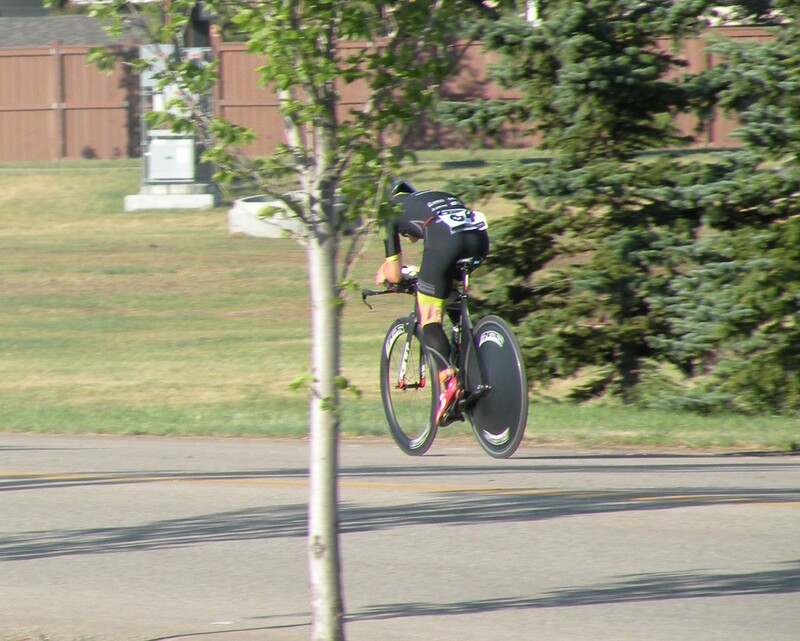 The bike course was flat, flat, flat. The pavement quality could have been a little better, but never in my wildest dreams did I imagine that I would come up with the results that I did. I’ve done a lot of work this winter and spring on my bike set-up and position in order to create the fastest and most aerodynamic option I could manage. I made upgrades to wheels, tires, tubes, saddle, and basebar, as well as cleaner cabling and a RETUL bike fit from Sweet Pete’s Bike Shop that is as fast as it is comfortable. A meticulously maintained drivetrain also makes a big difference! I started the bike with a mindset that somewhere around 31:00 for 20km would be a huge coup for me. 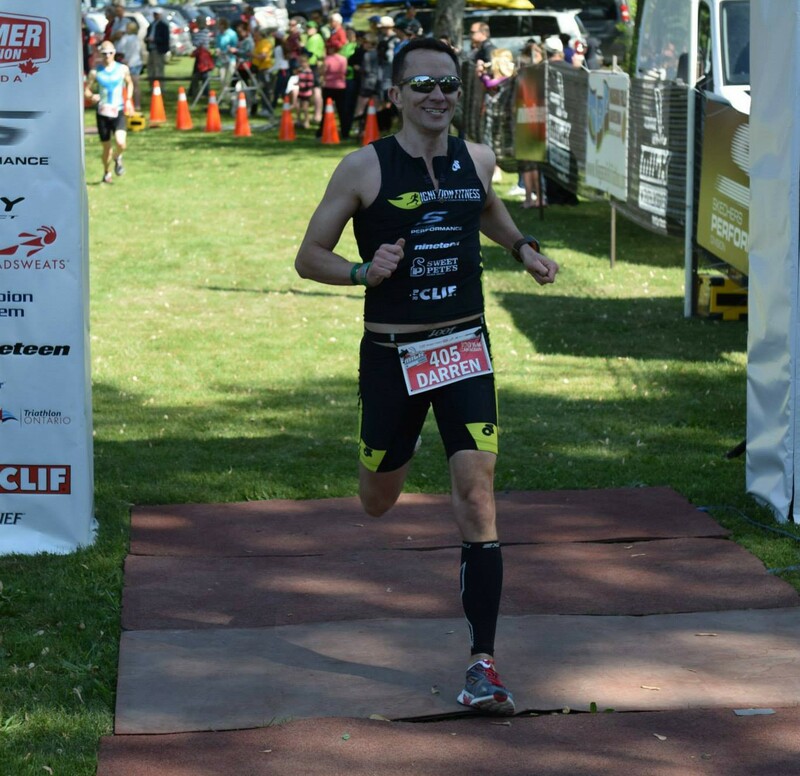 My previous best during a duathlon was 32:59 at Toronto Island last year, but I immediately knew that time was going down in flames. Being solo off the front of the race with clear roads ahead of me and the lead moto to focus on definitely helped, and after turning out of the headwind section at the start of the course, I watched my average speed slowly creep up towards and eventually beyond levels that I had never seen before. I rarely watch my speed during races, instead focusing on maintaining a consistent wattage, but I couldn’t help sneaking a peek every now and then on this day. My power stayed in control, and my NP of 227W was actually significantly below my goal wattage of ~240W for 20km. 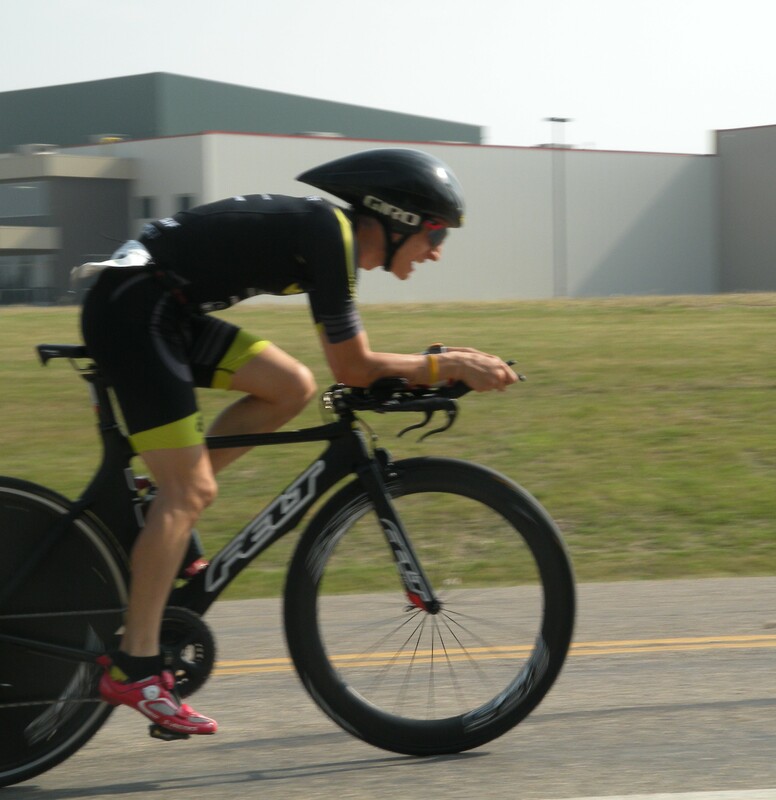 Channelling my inner Tony Martin on the bike – note the open mouth! As approached the last turn and sat up to undo my shoes, the realization crept in that I was about to come in under 30 minutes for 20km. I couldn’t help but break out into a huge smile, because never in my wildest dreams would I have imagined that this would have been the result. You can click the link above to see the file on Strava. To be totally honest, this last run was just a procession of emotions. I would have had to blow up pretty bad to not break 1:00 for the race. I struggled pretty bad on the last 1.25km, but I had enough time in the bank to fly up the final hill with a big smile on my face. My pace was pretty close to the pace of my first run, which after that strong of a bike is quite a bonus, and I was able to come across the line in a course record and new PB of 57:28! For 3 years now, I have been knocking on the door of the next level without quite being able to get there. 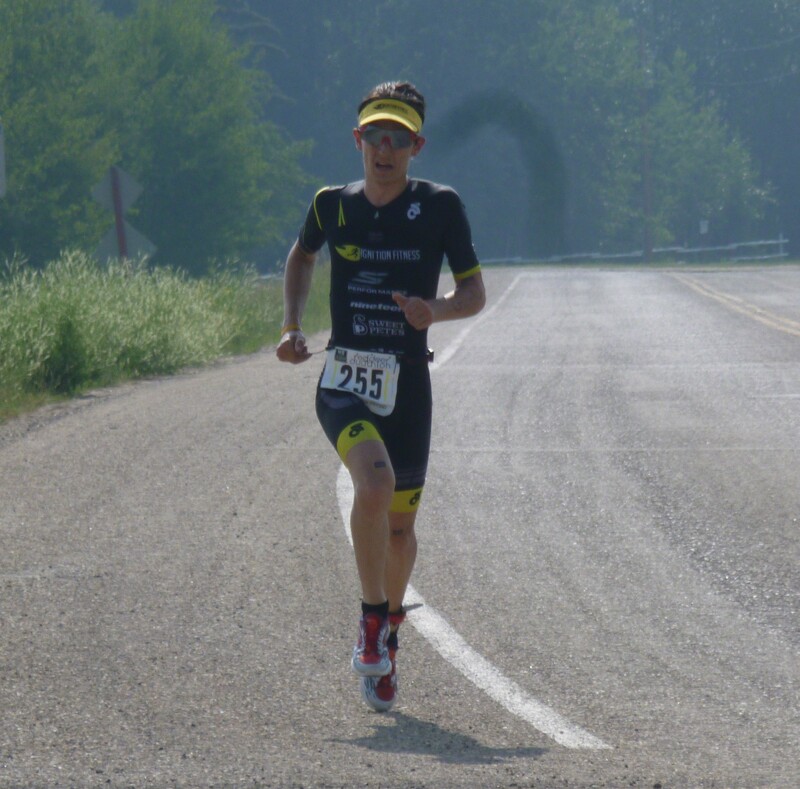 Since 2012, I have been flirting with 1:00 sprint duathlons and 2:00 standard duathlons, winning a few races along the way but always feeling like I had been sitting on a plateau without a way out. On Saturday, I think I got to that next level: I won on the bike with a legitimate, big league split. The runs were not too shabby, but I started the bike with less than a minute lead, and finished it with over 4 minutes in hand; that is a big deal for me. 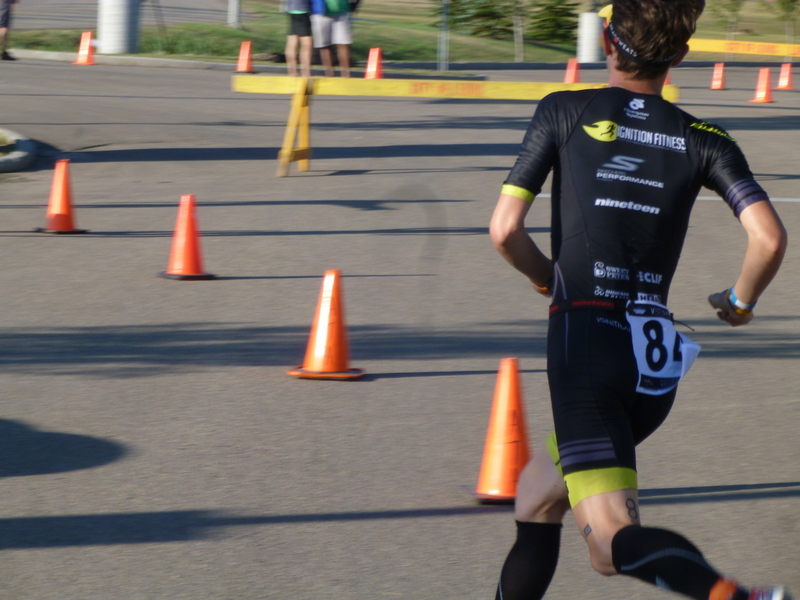 If my extensive research can be trusted, then this is the second fastest 5km/20km/2.5km sprint duathlon in Canada this year (as scientific as that analysis can be), behind only the esteemed Lionel Sanders. I am now buoyed with confidence going into Provincials next week and into Nationals in September as a legitimate contender, rather than the outside shot I considered myself before this weekend. There is a not insignificant amount of rain in the forecast for the weekend of Provincials, but I’ll be going into it looking for a good effort over the standard distance as preparation for the real thing in Montreal. Welcome to the big leagues, JB. A huge thank you to all my supporters for their continued help this season. Coach Tommy of Ignition Fitness, that one was for you and your continued belief in me even when I was ready to quit. Chris and the guys at 3SIXTY5 Cycling, you guys have been nothing but great. Not only does my FAT60 set-up fly on the road, it gives me one of the best looking bikes in transition. And I continue to fall further in love with the Skechers Performance running shoe line; the GOMeb Speed 3 makes a great racing shoe, and the rest of the line covers all my bases for training. Next week is Provincials, so watch for my next update very soon! Until next time…keep Du’ing it! 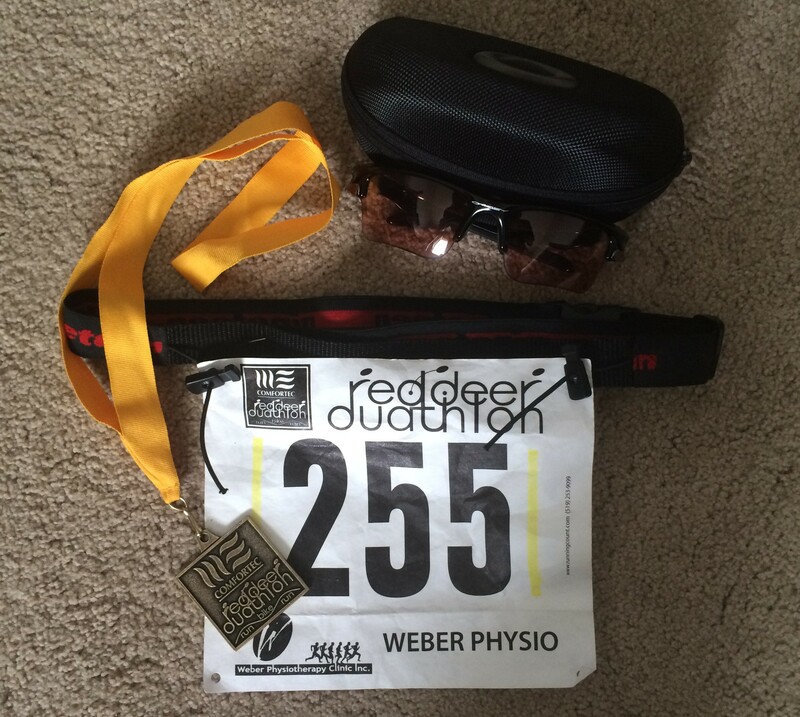 Obligatory bib number shot…complete with my gold medal and brand new Oakley Fast Jackets courtesy of the race organizers for my overall win!